Obal: soft, Stav: Nová, Life moves at a leisurely pace in the tiny town of Wall - named after the imposing stone barrier which separates the town fr_om a grassy meadow. Here, young Tristran Thorn has lost his heart to the beautiful Victoria Forester and for the coveted prize of her hand, Tristran vows to retrieve a fallen star and deliver it to his beloved. 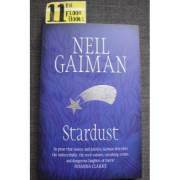 It is an oath that sends him over the ancient wall and into a world that is dangerous and strange beyond imagining . .
Obal: soft, Stav: Nová, This is a stunning collection of short stories by acclaimed fantasy writer Neil Gaiman. His distinctive genius has been championed by writers as diverse as Norman Mailer and Stephen King. With The Sandman Neil Gaiman created one of the most sophisticated, intelligent, and influential graphic novel series of our time. 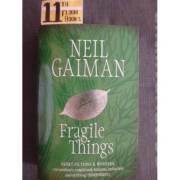 Now after the recent success of his latest novel Anansi Boys, Gaiman has produced Fragile Things, his second collection of short fiction. These stories will dazzle your senses, haunt your imagination, and move you to the very depths of your soul. This extraordinary compilation reveals one of the world's most gifted storytellers at the height of his powers.